All new animals should be quarantined before you introduce them to your existing livestock. Chickens are no exception. Keep your flocks separated for a month, and make sure to wash your hands if you go between flocks so that you don’t carry any bacteria. One sick newcomer can take out a whole flock, so while it can be a pain in the neck, especially on small properties, it’s really important. If your new birds haven’t shown any signs of lice, mites (scaly legs), fluid from the eyes or other symptoms of illness go ahead and move onto the next step. If they do, get them healthy or put them down. At this step, the two flocks can see each other, but they are separated by a fence, chicken wire, hardware cloth, or a crate or pen. Each flock has it’s own space, feeders, and waterers, but they aren’t totally separated any more, and can start getting used to each other without the ability for anyone to get hurt. Keep the newcomers in eyesight for a week or two. If you are introducing chicks to already grown chickens, wait until the chicks are roughly the same size as your adult birds before moving onto the next step. Should You Put Your Compost Bin In The Chicken Run? Before you put all the chickens in the new pen, make sure there is enough space for all the birds. Crowding can cause major problems. It’s also a good idea to add a few hiding places for any picked on birds to escape. Branches and other things to roost on are good options. Put in extra feeders and waterers. The more dominant birds will chase the newcomers away for awhile, and you don’t want them to go hungry. Side note: My favorite style feeder and waterer are simple rubber pans. The larger pans are good for water, and are easy to clean and get ice out of in the winter. Gravity waterers are always dirty, and those huge gravity feeders turn into a neighborhood rat buffet. The smaller rubber pans work great for feeding a daily ration and are easy to clean up at the end of the day. Click here to check them out. Also make sure there is plenty of entertainment. Bored chickens are not nice to each other! You can hang a cabbage to peck at, throw in plenty of weeds, leaves, or straw to scratch around in, or rearrange their coop so that they all are adjusting to a new space at the same time. Chickens will peck at each other as they establish their new hierarchy. Your job is to make sure that it doesn’t get out of hand. If there’s blood or missing feathers pull the injured bird out and separate them immediately. If one bird is overtly aggressive you can pull it out for a few days and then re-introduce it. It will be more likely to settle in to a new spot in the pecking order. If the birds just don’t settle down after a few days, go back to a separate pen for the new flock. Make your run larger before introducing them, or have them free range the next time you put the two flocks together. Sometimes there’s just a chicken that is a bully. If the new birds are getting enough to eat and aren’t showing signs of bleeding or feather lose it is most likely normal. Just make sure to keep multiple feeders and waterers out so everyone gets enough to eat. Alternatively you can rehome that bully to the soup pot. 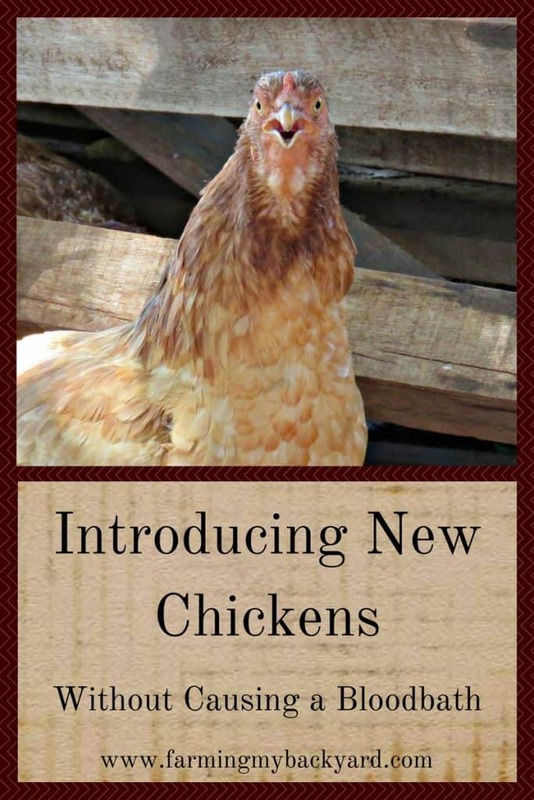 Have you successfully introduced new chickens to an established flock? Will you be introducing new chickens to an existing flock for the first time? Share what works for you, or any questions in the comments! I had two bullies, that would jump submissive chickens, and would kill them (2) had I not intervened. I decided to try Pinless Peepers, and they worked for me. Now these two bullies do not attack their pen mates and are “one of the gang”. It my flock, it is the submissive chickens, the ones who squat down and take the abuse, who may be relocated/sold to someone who can free range, as I don’t think their mild manner can be changed, and they will certainly be picked on wherever they are in a penned run. That’s true, the very submissive ones can take a real beating in a small area. Will my coop bred chicks have a problem with the older established birds. When do i take them from the nursery? Chicks can go outdoors when they are fully feathered, (around 6-8 weeks for most breeds). Make sure to keep them separated from the older birds by a fence until they are about the same size though. My baby chicks are a smaller breed ! Will the bigger Birds accept them? Some people keep bantams and standard sized chickens together with no issues, so it’s definitely possible! Start with them separated, go slow, and be ready to separate them if needed. I’ve been lucky….introduced one new bird to my small group of 3 chickens. Kept the new girl in the chicken pen while the others roamed free for 1 day. They were curious of the new gal and stayed by the pen to watch her. That night they all slept together and the next day I have 4 happy chickens who have accepted the new gal. They all free range together now. Nice! Sounds like a very smooth transition for them all. My daughter got a new chicken so her kids wouldn’t be upset that one was apparently taken by something. The 3 old ones chasing it a bit. Will they accept it eventually ? Yes, once they molt their pecking order changes each year. Keep an eye on the new chicken though, because she will be picked on until that happens. She’ll need lots of places to hide and get away, and probably her own feeder and waterer for a while.